ATLANTA, April 27, 2017 – The Data Profits Team has noticed the most Frequent Question we receive is “What is The Difference Between Demand Forecasting and Sales Forecasting?” In fact, our most-read blog of all time deals with this subject. 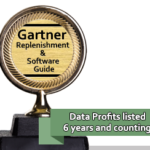 Even though this blog post is over 5 years old, it still attracts thousands of users to our website www.data-profits.com each month. 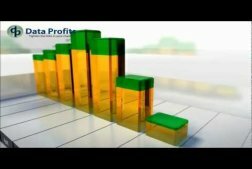 Data Profits’ goal is to educate our customers and readers/viewers of our blogs, SlideShare presentations, and YouTube videos. We realize that millennials and others learn better by watching a video rather than reading a blog. 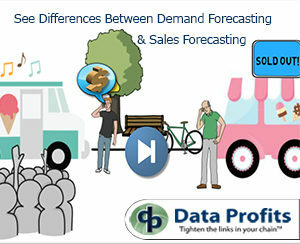 Therefore, we introduced a new video that helps explain the Difference Between Demand Forecasting and Sales Forecasting. Click Here to watch our new video. Even if you feel you know Difference Between Demand Forecasting and Sales Forecasting, you may pick up a few tips for educating others. Some resellers of Demand Forecasting Solutions do not offer Comprehensive Demand Forecasting Systems like Data Profits, which offers users the ability to calculate lost sales. Additionally, user managed forecast alerts and product/ location business rules based exception management help our customers maintain forecast accuracy above 90 percent. Some Demand Forecasting Solution resellers offering less functionality and features try to be less than forthcoming about the functionality they provide. In fact several systems on the market say they Demand Forecasting when in fact they are sales forecasting systems. You know the Difference between Sales and Demand – does your Forecast? Most people assume if a food label says it is ‘natural’, the product is a healthier choice. Sadly, a little reading will highlight how wrong this assumption is to your health. The same can be said of a multitude of forecasting systems that say ‘Demand Forecasting’ when in fact the system is using a sales forecasting method. When you find yourself repeating the past you have your first highlight into a big problem in forecast systems today. Demand and Sales Forecasting should have different methods, not different algorithms. Demand and Sales each have a separate purpose in your business, your systems should have a different process to calculate a demand forecast separate from a sales forecast. 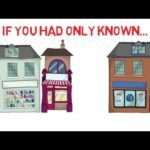 Watch this 2.5min video comparing result of two businesses. One business is using demand and the other sales forecasting. Listen to how they are using their tools and see if their results are familiar to your business. Copyright © Data Profits, Inc. 2017 All Rights Reserved.